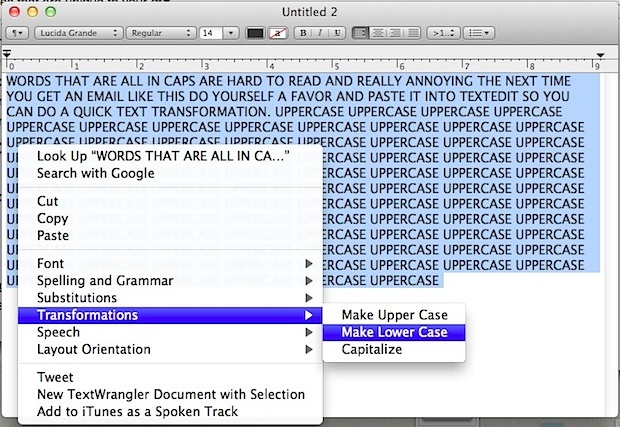 We all know it’s pretty annoying to reading text that is ALL IN UPPERCASE CAPS, but fortunately with the help of text transformation tools, we can instantly convert that obnoxious uppercase text into lowercase caps (or vice versa, if you really want to…). For the purpose of this example, we’ll use TextEdit, the great little text editor app that is bundled with Mac OS X. You can either do this with an existing document, or you can just paste a block of text into the app, but we’ll assume you’re working with the entire document, pasted in from an email or otherwise. You can also find the Transformations menu under the general “Edit” menu within TextEdit, but the contextual menu accessible via a Right-Click is usually easier for most users. The text casing transformation takes place instantly, and the converted text continues to be highlighted after changing casing. If you want to go the other route, just select “Make Upper Case” instead. Thinking beyond TextEdit, the text transformations work across Mac OS X in all native cocoa apps, including Safari, iChat, iCal, Mail, Stickies, and any other third party app that included the service. Similarly, another nifty text transformation in OS X is the ability to convert text to spoken audio for iTunes with just the selection of text and a right-click. That uses the built in text-to-speech tools to redirect the spoken words from the Mac into an audio file right in iTunes, which can then be synced to an iPhone, iPad, or iPod – very nice. Do you guys just post random stuff whenever you are out of ideas for new articles? When I tried this, only the first word got changed. I shrieked like any other Lion user would by this point, you know, like a damned soul, because maintaining hope that the little things, once a hallmark of Apple operating systems would work properly has been an utterly soul blasting experience, and copied the text to vim, where it was formatted properly, pasted it back into the document, and leaned over and cried because I broke my Snow Leopard CD last week. If this is the man’s legacy, better to live the life of a divorcee in Topeka. I guess I missed something about your tip. Why do you think it is easier to read a document written all in lower case letters (without appropriate capitalization) rather than reading text written all in upper case? E-mail etiquette has established that typing text all in upper case is equivalent of shouting and therefore rude. But there are other “cultures” out there where writing in all upper case is the norm and not considered rude. For VIM users, ggguG will put all text in lower case, and gggUG will put it to upper case :D.
For non VIM users, gg takes you to the beginning of the document. gu converts text to lower case. But which text? The text the next motion command moves over. Next command is G which takes you to the bottom of the document. So effective, this is read as go to the beginning of the document. Convert to lower case to the bottom of the document. Similarly, the other case but this time gU converts to upper case. Finally, Finally, Finally!!! I have to handle a lot of copy at my job, and would have to place it into Adobe InDesign when I came across ALL CAPS to format it easier. But now I can use Text Edit with essentially this same feature!!! Works for me, upgrade Pages! For those of you using Microsoft Word (and PowerPoint), shift-F3 cycles through all caps, capitalize words, and all lower case. If you position the cursor at the start of a word, this is done on that word; if a region is selected, this is done on the whole region. What is the name of the text application you are using? I appreciate this, but is there anyway to do it in pages? If not I’ll just copy and paste it into textedit any time I need to use the feature. Hi there is a simple Mac app that does exactly that in one click only: http://www.daniele.catalanotto.ch/lowly. Hope this helps. Back in the old days before OS X, when my computer just wrote what I wanted and did not try to anticipate what I wanted to do (now it’s almost always wrong), scratch my back, etc., I could change a paragraph from all caps to lower case by hitting shift F3. I tried to follow your instructions, but when I press font, my menu looks nothing like yours. HOW DO I CHANGE A PARAGRAPH IN UPPER CASE TO LOWER CASE IN OS X LION?